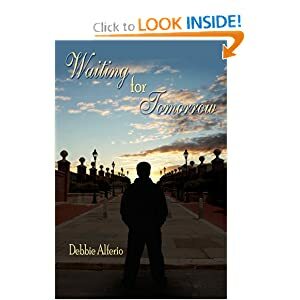 Debbie Alferio is the award-winning author of the Forever Love fictional romance series. She writes without outlines and is quick to say she hasn’t received any formal writing training, and gushes about her crush on Country Music recording artist Chuck Wicks, the inspiration for her books' main character. Unapologetic about her aversion to outlines and her self-published status, Debbie offers practical and encouraging advice for other writers, and reminds us how important it is to remain true to yourself. You’re the Ohio rep for Authors Across America and a member of the International Writer’s Association, American Author’s Association, OhioProfessional Writers, and Writer’s Ink. So you’re obviously steeped in writerly advice. But, really, you’ve never used an outline? I know of a lot of authors who prefer to use outlines and swear by them, and others who find them restricting. I fall into that latter group. On the few occasions I have tried to outline, I've felt like, if I didn't stick to the thing like glue, my finished product wouldn't be worth its weight in salt. When I write, I like to let the muse take control, and if the plotline or characters happen to change direction midstream, I can go with it. For me, outlining means feeling too rigid and structured with my writing. I enjoy the freedom to let the elements of the story unfold as I go along. Luckily for me, it's worked very well so far! Please, tell us what it’s really like working with AuthorHouse. (And don’t just say “great!”) Do you act more like an entrepreneur than author? How does the editing process work? What kind of marketing support do you get? Am I allowed to say wonderful? How about fantastic? LOL. Seriously, my experience with Authorhouse has been very positive. The company produces a quality product, the staff is always friendly and knowledgeable, and although they're one of the larger independent publishers, I've never felt like I was just a number to them. Authorhouse makes my books available through thousands of online outlets worldwide, and they can be ordered via Ingram, Bowker's, and Baker & Taylor. To be honest, I believe that all authors, regardless of the method they use to publish, are entrepreneurs of sorts. Your book is your business, and ultimately, no one can promote it the way you do. The company does offer marketing support, and the advice I've received from my Author Services Representatives over the years has been priceless in getting me to where I am now. As for editing, the company does offer this service; however, I preferred to use my own editors. Would you describe your editing process, then – and how you've found editors? Let me share a little story. When it came time to edit A Forever Kind of Love, I was not in a financial position to pay for professional editing services through Authorhouse or from the private sector. Knowing enough about the process to understand editing is a must, I chose a group of close family and friends to take on the job for me. I was very grateful for their help; and while they spotted many of the more "obvious" errors like grammar and punctuation, there were a few things overlooked which ended up getting published in the book. Fortunately, those things are very minor so as not to detract from the overall quality of the story or be picked up in most cases by the reader. Do they bother me? Of course---no one wants mistakes in their work, but it does happen, and sometimes even with big-name authors. Anyway, the second time around I guess you could say I had "lived and learned" enough to find someone with more actual editing knowledge. The lady, Arlene Towne, was one of my high school teachers. Mrs. Towne worked over my 470-page manuscript for "Waiting for Tomorrow" five times--word by word, line by line. She not only edited, she also mentored me in the proper usage of commas (I tend to be comma-happy!) as well as where dashes and semicolons can be used instead. She took the time to make sure the work was polished before it went to the printer. Her diligence paid off in one of the highest compliments I have ever gotten--actually from a friend who is a freelance writer and editor herself. She told me that "Waiting for Tomorrow" was one of the most perfectly edited works she has ever read! So, the moral of the story? There are many ways to find a good editor; just be sure that whoever you choose actually knows what to look for. Be sure they understand the principles of sentence structure, grammar, spelling, punctuation, as well as what sounds right to make the story flow. A good editor is a great asset to you and the success of your work. When you conduct writing workshops, what’s the most surprising thing you tell new (or old!) writers? What do you think is the “aha” moment for those listening to you? New writers often are surprised when I tell them that I make a higher royalty per sale being independently published than some of the traditionally-published authors I know, and that they often do as much marketing as I do. There seems to be a misconception that traditional publishing houses automatically shower you with money and publicity when you land a contract. I tell them sure--if your name is Nora Roberts or Clive Cussler! LOL. Now, I'm not knocking anyone's choice on how to publish--that's a personal preference. Traditional publishing has its advantages, but in most cases for the new author, don't expect to get rich or famous overnight. You still have to work at it. Promotion is a tough nut to crack for most authors. You’ve shared some very helpful, practical advice on your blog. Have you done anything sort of quirky or unusual that really paid off? I'm not sure if it qualifies as quirky, but I've developed a knack for incorporating the phrase, "I'm an author" into just about any conversation or situation I find myself in. I've been known to tell everyone from the UPS guy to the clerk at the grocery store what I do, and in many instances, it's either resulted in a book sale or sometimes even a speaking engagement. I simply make sure to listen and watch for an appropriate window in the dialogue, make a casual mention of my art, and go from there. It helps, too, that I always carry brochures in my purse for those occasions so that I have something to offer about my work. Word of mouth is still the best way to advertise! Thanks, Debbie! Your advice is helpful and I'm sure it will be appreciated by many new (and not-so-new) writers. Now, dear reader, can you help me out? I’ve been lucky enough to post advice from Debbie, Derek Taylor Kent, Carmen Ambrosio, and Andrea Richesin so far this year and now, I’m looking for guest bloggers again. If you’re a published author or professional copywriter, and would like to share a few words of wisdom here, please contact me. I’m also looking for guest writers for my reading blog, where you can chat up your favorite (or most disappointing) reads. I hope to hear from you soon! Next up... what should a writer do for the holidays? My first set of bookplates were very pretty, and generic. In fact, they were from the first vendor I found online when I searched for "bookplates." Like, duh. After all that research to find a nearby vendor and secure a reasonable price, ultimately, the best option for me was to order from BookplateInk. Sheesh. When the first edition of my book was published, I followed the oft-heard advice to "give a copy to all of your friends." Well, there are some problems with that. First, which friends? No matter how excited I am about my book, it's financially unwise to hand a $17 book to each of my friends (even with my author discount). So I redefined "friend," this time looking critically at my contact list to select those who appeared to be most likely to tout the book to others, or (in a few cases) buy a bunch of books for other people. In other words, I learned to give to the friends of my book, but sadly, not to all of my friends. 4. Spent too much time on Facebook. I'm still struggling with this one, too. Check out my Facebook page, where I waste a lot of time I could be spending on the trail. Or not. As friend (and award-winning author) Debbie Alferio points out,* word of mouth is the best form of advertising. I've been too cautious about mentioning that I'm an author in the past, a habit I vow to correct before it's time to make New Year's resolutions. I've also stumbled when promoting events. Once I lost a sale because I didn't show up early (aim to arrive at any signing at least 30 minutes in advance) and another time, I planned a GRAND event with another author... and turnout was abysmal because I didn't chat it up enough. I Facebooked** the heck out of it, though; yet another reminder the original social networking tools - your face! and your mouth! - are often more effective than newer ones. I'm sure I'll discover many more mistakes I've made... but until I'm willing to admit them, what about you? Got any mistakes to share? *OK, she wasn't the first to say so, but she makes the point eloquently in an upcoming guest post. **I know it's not a verb. But you knew what I meant, didn't you?